Program #CHON167. Recorded in Lexington, MA on September 20, 2001. 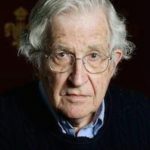 Chomsky’s timely interview with AR’s David Barsamian recorded 9 days after the 11 September 2001 terrorist attacks in New York and Washington D.C.. Chomsky gives his usual sharp insight, providing context for the attacks in light of history and international terrorism.